I can't handle bittorrents. I don't know why, but I've always had really sketchy luck downloading 'em. I'd say my success rate has been something like 5% at getting the ones I've tried to. I don't wanna kick off the blog by outing myself as an internet nincompoop, but there ya go. 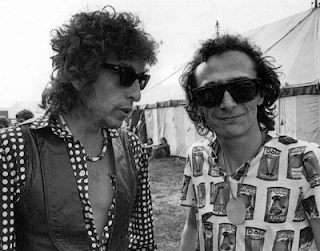 But thankfully, one -- or rather, four -- torrents that did work for me were these four great solo sets from Graham Parker, opening for Mr. Bob Dylan in February, 1991 at London's famous Hammersmith Odeon. To me, this period of GP's long career, at the cusp of the '90s, was very rewarding, even if it didn't always reach the stratospheric heights of those first three albums with The Rumor. This was where the angry young rocker transformed into an older, wiser singer-songwriter. And I love the Mona Lisa's Sister and Struck By Lightning albums as much as anything else in his catalog. These four consecutive shows (there was no performance on the 11th) draw heavily from the two albums above, especially the then-new Lightning, and pick a few choice morsels from Parker's earlier career. He really rises to the occasion of opening for a legend, and performing for a discerning and respectful audience. Dylan did a further four dates of this residency (2/13, 15, 16, 17), but I don't know if GP opened those or not, or if so, if there are tapes of those shows, too. Apparently, GP did play support for the Dylan show on 2/5 at the Point Depot in Dublin, too. There was a show at Belfast the following night but, again, no info on GP. If anyone has any insight -- or recordings! -- please let me know. I love these songs so much that listening to these shows was like a dream come true for me. The sound's a bit trebly, but a little fiddling with EQ should help with that. They are audience recordings, and there is some audible background conversation at some points, which is mildly distracting but never comes close to overpowering the music in volume. I can't really say which show is best; I'd get all four of 'em and assemble your own highlight playlist if you don't think you'll wanna keep all four. Thanks a million to the folks who originally taped, transferred, and posted these files, which I got from those torrents but have never seen anywhere on a music blog. Sorry I went against someone's wishes and made mp3s from the FLAC files, but, yanno... see the prior post for my position on that. Thanks to Jeffen of musicruinedmylife.blogspot.com for finding the great Bob 'n' Graham photo! Bobwatchers will note it's from the legendary Picnic at Blackbushe concert in 1978, not these '91 shows. Unfortunately, The Mona Lisa's Sister is currently not in print, though it is widely available used, but if you want to pay something for this great music that will actually get back to Graham -- not to mention score yourself an amazing disc, whose studio versions of these songs are downright wonderful, featuring players like John Sebastian and Garth Hudson, and one of my favorite violin parts ever, by Jay Ungar on The Kid with the Butterfly Net -- go buy Struck By Lightning here. P.S. If there's serious demand, I'll post the original FLAC files too. And this is my first post on my first music blog, so please let me know if there's any problems with downloading, decompressing or playing the files. NOTE: I realized after posting that these were the 192Kbps transfers I did, not the 320K ones. I might not get to it today (Valentine's) but in the next couple days I will post the higher-res files too. Thanks! nice to see your blog up here, and what a great first choice w/Graham Parker - but just wondering/hoping if you wouldn't consider 320Kbps mp3s . . . thanks! Thanks for the suggestion -- I realized last night after I posted that these weren't at 350K -- and that's the least I can do to respect the wishes of the original FLAC posters! I will repost higher-res files in the next day or two (might not get to it on Valentine's Day!). Sorry to anyone inconvenienced or offended - chalk it up to a beginner's oversight! Just wanted to say it is great to see a new blog at this time as so many are being killed. Great fan of GP looking forward to hearing them. By the way ML says the 10th is not available. But if you are going to repost at 320 I will get them all again. Thanks for this and I am sure I will be coming back here often. Good Luck. Great blog you got going here. What is THIS -- live '91 GP as your first post? and plenty of EC as well as early & obscure Richard Thompson? MegaUpload is long gone, any chance of a repost of the 4 shows, or an up to date link if one exists?? Greatly appreciated in advance!